For whatever purpose you plan to use your caster, it’s likely important to you that it moves. This could be that it moves freely or can make a sharp turn or that it has a wide degree of rotation. However, depending on your industry or caster needs, as important as mobility might be; the ability to stop and be stationary might be as important. This is when you would want to also get a caster lock to use on your item. It can be tough to know the capabilities of different floor locks and locking casters. Here’s an overview to remember while determining which floor lock you might need. The first decision you will need to make is if you are looking for a floor lock or for a locking caster. What is the difference? A floor lock is an additional piece, in addition to your casters, that you lock with your foot. When engaged, the height of the lock sits higher than the space between the floor and unit bottom. This allows the item to be ‘locked’ in place until the floor lock is disengaged. 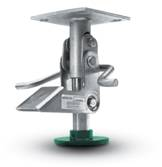 Floor locks are usually used in the medical fields, warehouses, or to make a cart level on an uneven surface. A locking caster looks very similar to a normal caster, but with a lock for the wheel. When you lock the caster, the wheel is unable to spin. Locking casters are best for items when the lock is needed to keep the unit stationary, but not encountering a lot of force against the lock (like you might get when loading and unloading). Standard Floor Lock: The most traditional style of floor lock, the standard version can offer up to 9 23/32” in locked height. It is intended for level surfaces and can work with wheels between 4” – 8” in diameter. 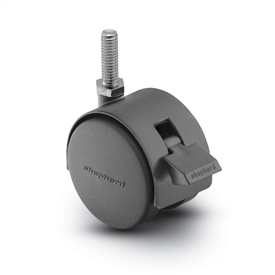 Double-Pedal Style Floor Locks: Similar both in height and compatible wheel diameter to the standard floor lock, this style of lock has one primary difference. That would be the two pedals to disengage the lock. Additionally, the rubber pad on the base of this style of lock cannot be replaced. Heavy Duty Floor Locks: Does your industry deal in moving of products that are considerably heavier than most? There are heavy duty locks available to you. They can support a weight of up to 1,000 pounds and still are a foot-activated lock. These cast iron locks can support wheels with a diameter of 4” – 8”. If you are looking for your casters to have the added feature of being occasionally stationary, locking casters would be what you are looking for. These locks are built directly into the wheels themselves and can also be foot-locked. 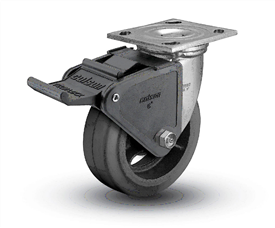 There are several varieties of locking casters available. 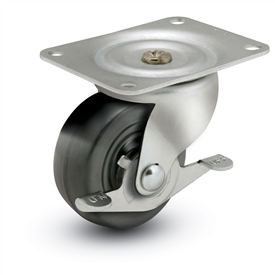 Plate Mount Locking Caster: This style caster is an indoor and outdoor caster. When engaged, the locking mechanism pressures directly on the wheel itself to securely stop motion. Locking Stem Mount Caster: This style caster is standard on food service equipment found in kitchens or restaurants. There is a side locking brake that, when engaged, applies the lock directly onto the wheel. Locking Dolly Caster: Dolly casters have some of the most options available in the industry. Their locks operate a little differently, where the lock actually locks down the wheel well to stop motion. This is different than the other locks we’ve seen that are applied directly to the wheel. Locking Furniture Caster: The smallest of all the caster styles, furniture casters are used in various pieces of home and office furniture. 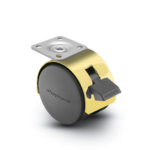 Similar to some of the previous caster styles, these lock by applying a pressure pad onto the wheel itself, stopping motion. 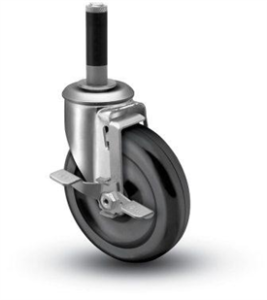 There are countless styles of casters out there and many have locking options. Beyond those, there are many units you can add a floor lock to. Depending on the industry, expectations, applications, or environment you’ll be using your casters, the lock style you need can vary. If you are looking for more information on those mentioned above, or to learn about other styles, contact us today!